The three-tier bridge is inspired by the Islamic architecture of the famous Khaju Bridge in Isfahan, Iran. 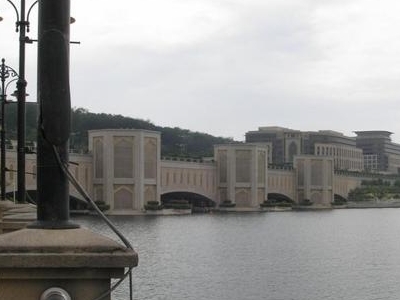 Its magnificent attractions are the four minaret-type piers, complete with observation decks, overlooking the Putrajaya Lake.This unique bridge provides access to pedestrians, vehicles and a monorail, while its pier will be developed into a fine dining area with a place for boats to berth. Parkmay (Cityliner No. 868) comes every 20 minutes. The route is Sinar Kota-Komuter Serdang-Putrajaya-Cyberjaya. Sepang Omnibus (No. 536B) goes through Sepang-Banting- Dengkil-Cyberjaya-Putrajaya every 3 hours. Kelang-Banting Bus (No.131) follows Kelang-Banting- Dengkil-Cyberjaya-Putrajaya route every 2 hours. Sum Omnibus (No. 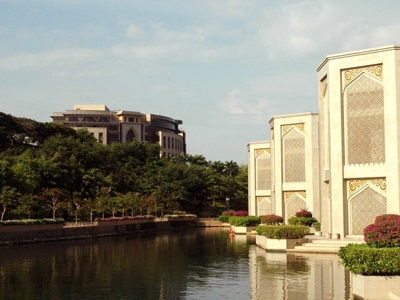 186) from Kajang Terminal Bus, UNITEN- Putrajaya and Cyberjaya runs every 1 - 2 hours. (Putrajaya Internal Nadi Putra bus services are available at 50 sen per ride). every hour (off peak hours). 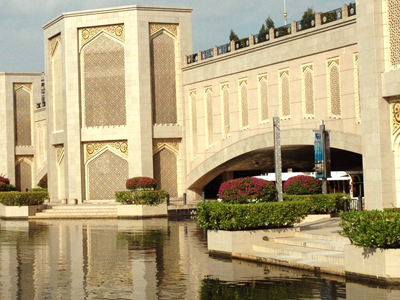 The most convenient way to get there is to hire a car or a taxi for the day to better explore Putrajaya. Here's the our members favorite photos of "Bridges in Putrajaya". Upload your photo of Putra Bridge!